If you count yourself among the legions of debt-saddled millennials who slashed cable television out of their bills about a decade ago, you probably think of the History Channel as being a continuous 24/7 stream of World War II documentaries. But over the years, a lot has changed over at the big H. While History.com continues to be a well-sourced encyclopedic resource of everything that's ever happened, the website's TV counterpart has become … well, if the old History Channel was a do-gooder straight-A student, the new History is a cranky old conspiracy theorist who secretly binges reality shows. Probably the worst thing about the History Channel's transformation, though, is that a lot of real history, reality, and facts have become so badly distorted that Morpheus from The Matrix would do a double take. Here are some of the worst offenders. Everyone remembers the first time they caught old Uncle Bob kicking back with some pizza, putting on a tinfoil hat, and watching a weird TV program where a dude with the world's craziest hair credits every human accomplishment to aliens. Back then, you might've wondered why this nonsense was airing on the History Channel, but these days, everybody knows about Ancient Aliens. And yes, everything on Ancient Aliens is faker than fake, according to the Smithsonian. Even when Ancient Aliens pulls from real sources, it distorts, misquotes, and mischaracterizes them so badly that the show becomes a cheesy sci-fi epic rather than a genuine documentary. 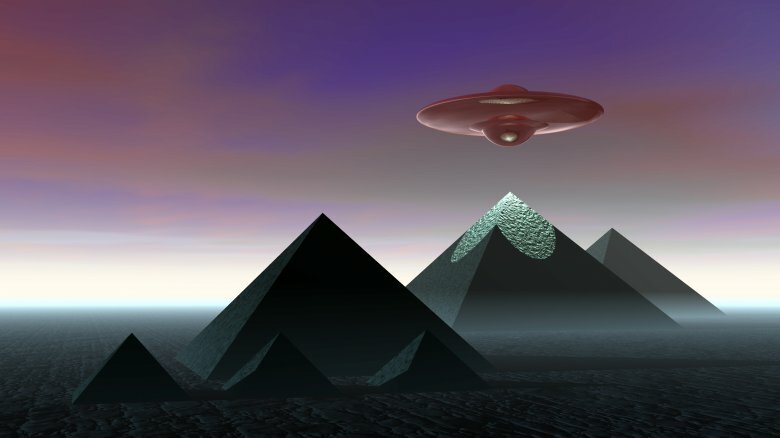 When History isn't making up narratives about how "maybe" (cue ominous music) aliens slaughtered the dinosaurs to make way for humans, it's promoting even zanier nonsense like the idea that ancient Egyptians flew extraterrestrial airplanes, according to The Awl. In order to create these zany theories, the program basically figures out a conclusion (e.g., aliens killed the dinosaurs), finds a real event that has zilch to do with their narrative (let's say a paleontologist found fake human footprints next to real dinosaur tracks), and then omits any information that doesn't support that narrative. Then, if something doesn't make sense? Chalk it up to those oh-so-mysterious aliens. Boom. Ancient Aliens is like a high school prank that got way out of hand. 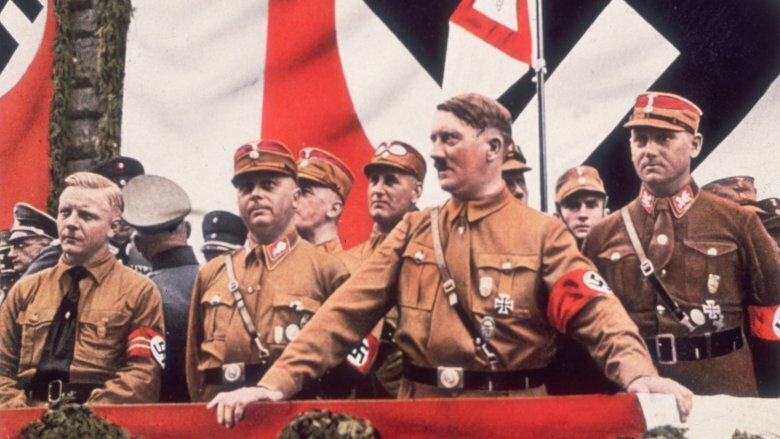 In 1945, Adolf Hitler committed suicide in his underground bunker. That's reality. That's what happened. Conspiracy theories about how he might've "escaped" aren't just wrong, but deeply offensive. Unfortunately, back in 2014, people got riled up when the FBI declassified documents reporting on the "possibility" that Hitler had actually run away to South America, shaved his mustache, and assumed a new identity. Here's the thing: FBI reports don't mean something really happened because the FBI has to document everything, no matter how stupid it is. So every time a lunatic or attention seeker claimed to see Hitler, they wrote it down. That's their job. As Skeptoid points out, the FBI has been forced to document all kinds of nonsensical falsehoods, from Amelia Earhart sightings to alien cattle mutilations. Then in 2015, according to Variety, the History Channel gave real history the middle finger. The reality show Hunting Hitler, ostensibly an effort to finally settle the matter with a crack team of investigators, was really nothing more than a ratings ploy. The series showed the team go to Argentina and investigate false leads which proved nothing whatsoever … because, you know, no genuine evidence exists. Aside from trivializing the subject matter, Hunting Hitler also trivialized reality. First, biopics deserve some leeway because turning a real person's life into an interesting movie (or series) is hard. But according to historian David Nasaw, the epic eight-part drama series The Kennedys — first optioned by the History Channel in 2009 — played so fast and loose with reality that it might as well have used a different surname. Overall, the big problem seems to be that the show's producer was trying to turn the Kennedy family into the Corleones from The Godfather, leading to a series full of crazy sexual escapades, sibling rivalry, and big money bribing. Some of the more bizarre fictional plot twists inserted into the story involve patriarch Joe Kennedy Sr., who is depicted as giving Jackie Kennedy a $1 million trust fund to stay with his son (which makes no sense), and also paying off a Chicago mobster to secure JFK's presidential win. Neither of these theories have any credibility, and are basically just there to spice up the narrative. 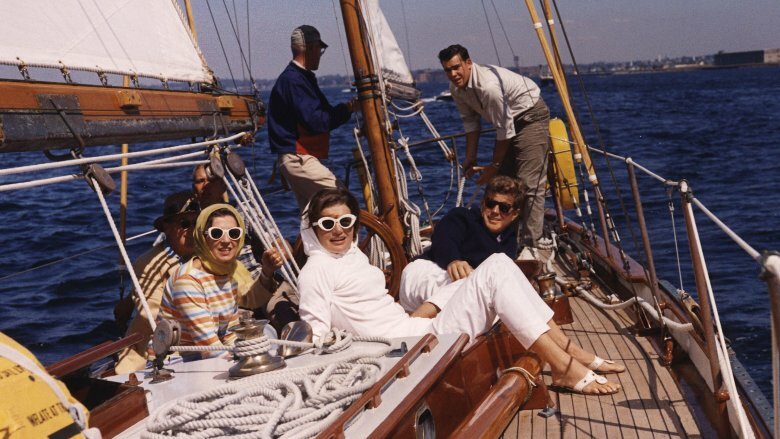 The actual Kennedys are a powerful family, but whether you love 'em or hate 'em, these characters weren't the real deal. The History Channel spent two years holding a place on their schedule for The Kennedys premiere, but when the series was finally ready in 2011, they quietly moved the series to their Canadian branch, History Television, according to The Globe and Mail. The disappearance of daring pilot Amelia Earhart in 1937 is a genuine mystery, and while there are some wacked out theories about what happened, most people have accepted that her true ending was probably a lot more tragic. That's why the whole world got pumped about the History Channel's 2017 special Amelia Earhart: The Lost Evidence, which theorized that Amelia and her navigator Fred Noonan were captured by the Japanese and may have even lived for some years afterward. 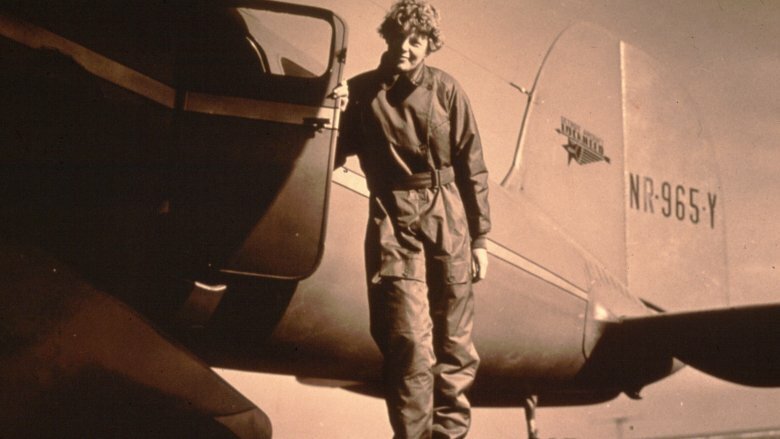 On the surface, this special wasn't just some Ancient Aliens nonsense: The conversation centered around a new photo the network had unearthed, reportedly dug up from the U.S. National Archives, which depicted Earhart and Noonan both alive in Japan. While nothing was confirmed, the story got national attention. Then …two days later, the whole thing got debunked. According to National Geographic, an intrepid internet blogger found the exact same photo in a Japanese coffee table travelogue published in 1935, two years before the famous pilot disappeared. Oops. Okay, it's long past time to rectify a sin that's been perpetuated for centuries: Assuming the biblical characters were real people, none of them were white folks. Seriously, all those people were from either North Africa or the Middle East, so there's no way they had European features or English accents. Yes, both classical artwork and Hollywood have been lying about this for a crazy long amount of time, but it's the 21st century, and the History Channel miniseries The Bible has no excuse for featuring such a whitewashed cast. To make things even worse, The Guardian points out that only two major characters are played by minority actors — Sampson and Satan. Yes, the devil. Could they be more offensive? 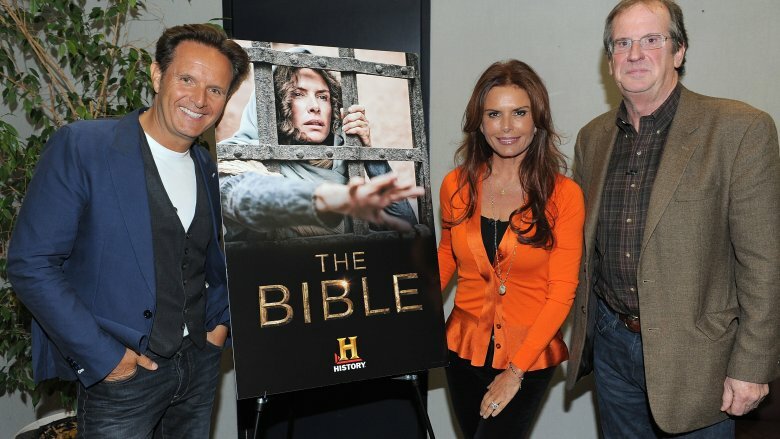 Ironically, the show's producers claimed their program was made out of a quest to cure "Bible illiteracy," but the series is Bible illiterate itself: The show cherry-picks elements from the "easy" biblical tales while ignoring more ambiguous, dark, or confusing aspects like the Book of Job, polygamy, the bizarre stuff with Lot and his daughters, or Moses getting angry about a golden calf. The result is a clean, sanitized, easy-breezy version that distorts the entire message of the text, rendering it unrecognizable. In other words, if your knowledge of the Bible comes from History's The Bible, you really don't know anything about the Bible. Wouldn't it be awesome if Bigfoot was real? The world would feel a little more magical, for sure. 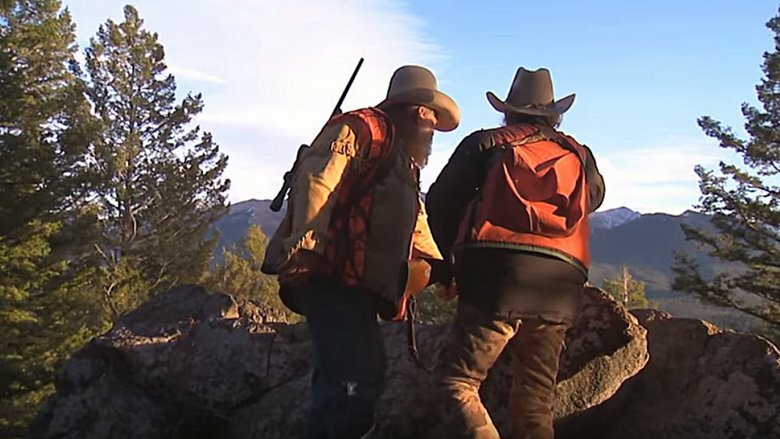 But there's no magic to be found in the 2015 History Channel special Bigfoot Captured, a ratings stunt that depicted a supposedly "real" sasquatch being apprehended. 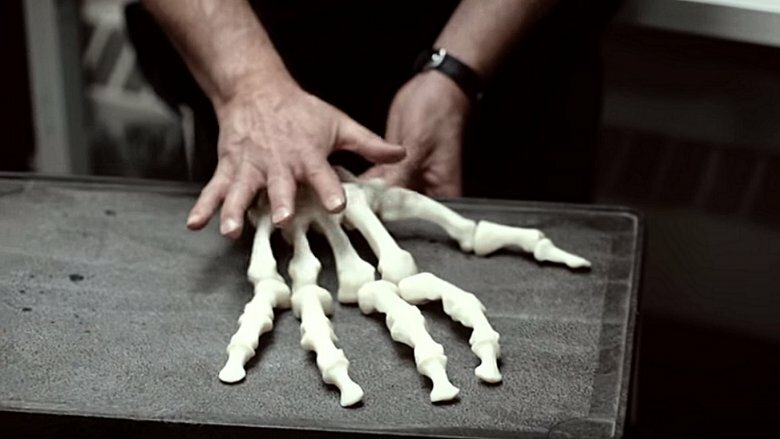 While some cool stuff came out of the program, such as an 8-foot 3-D-printed Bigfoot skeleton that was reported on by the Idaho State Journal, the special was deceptively advertised, featuring no clear documentation that it was fake outside of a small disclaimer saying the program featured "some dramatization." Some dramatization? Someone must have agonized for hours over how to write that sneaky sentence without giving the whole thing away. As Paste points out, people all over Twitter freaked out about the whole thing. Snopes even wrote up the series. Considering that much of Bigfoot's popularity today is the result of pranks, the fakeness of Bigfoot Captured perhaps isn't shocking. Still, the whole thing raises questions about the responsibility of filmmakers, and it's shady that the network interviewed professors like Dr. Don Jeffrey Meldrum without informing them of the film's purpose. Here's the scoop, according to the Telegraph: A few decades ago, someone might've discovered two bent, rusty iron nails in a tomb outside Jerusalem. Nails aren't exactly uncommon, but what's unique about these ones is that they were reportedly buried in a box marked with the name "Caiaphas," who in the New Testament was the priest presiding over Christ's crucifixion. Sometime afterward, the nails disappeared. Interesting? Oh yeah. But in 2011, filmmaker and journalist Simcha Jacobovici started running around saying these nails must've been the same ones that hammered Jesus to the cross, and claimed he'd tracked them down to a lab in Tel Aviv. Okay, so this is one of those situations where saying "you can't prove it!" usually just earns the response, "You can't prove it's not!" 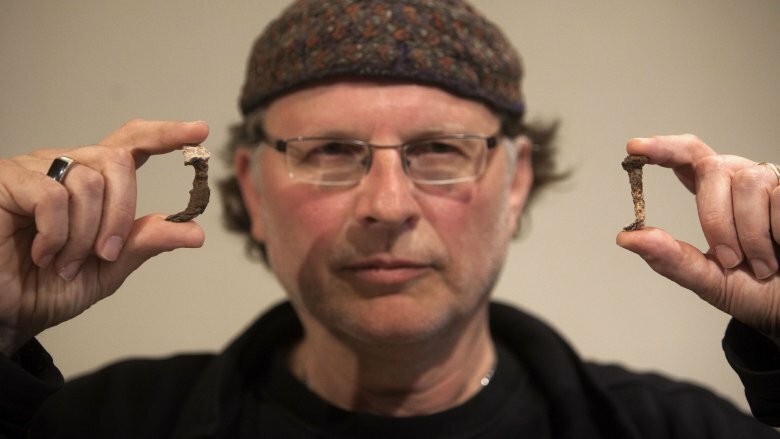 But professional archaeologists like Gaby Barkay dismissed Jacobovici's claims as a publicity stunt. Reuters even contacted a bunch of experts, who all brushed it off as hyperbole. That didn't stop the publicity-loving History Channel from giving Jacobovici the grand stage for the 2011 special Nails of the Cross, thereby turning these silly exaggerations into a future Christmas dinner argument for generations to come. The ancient Maya were unquestionably amazing. Their brilliant insights regarding mathematics and astronomy were so far beyond their time that it's hard to even conceptualize how they did it. 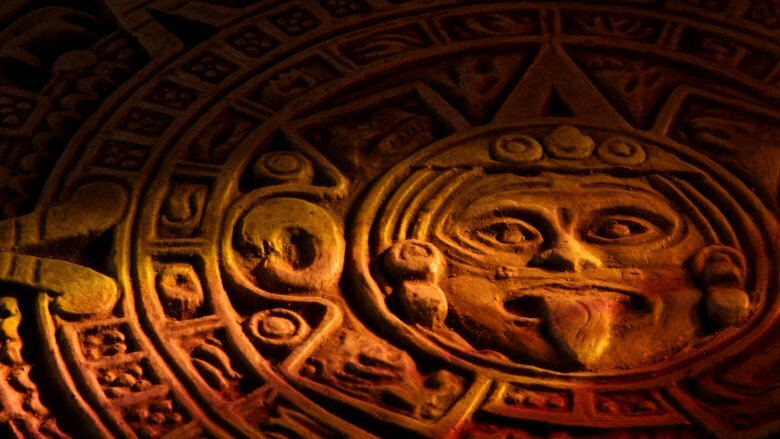 That's why in 2012, people got freaked out about that the Mayan calendar randomly ended on December 21, 2012. The History Channel did a lot of fear-mongering about this stuff, even referring to 2012 as the long-awaited "Doomsday predicted by the Mayan calendar." Then 2012 came and went, with no apocalypse. What happened? Don't blame the Maya; blame the History Channel. As National Geographic explains, the Maya never predicted a doomsday. December 21, 2012, was simply the end of the 13th cycle — the 13th Bak'tun — at which point the calendar would reset to zero. Basically, it's like how you put up a new calendar every January. If ancient Mayan traditions and culture had continued until the present day, uninterrupted, 2012 would've probably been an excuse for some wild festivals in preparation for the new Bak'tun, rather than another gloomy exercise in how many canned goods you can order in bulk. So if those ancient Maya had ever visited us via time machine, they would've scoffed at how all these silly 21st-century folks totally misinterpreted their calendar. Admittedly, picking on so-called "reality TV" feels like a cheap shot since mostly everybody knows how fake these shows are. Or do they? 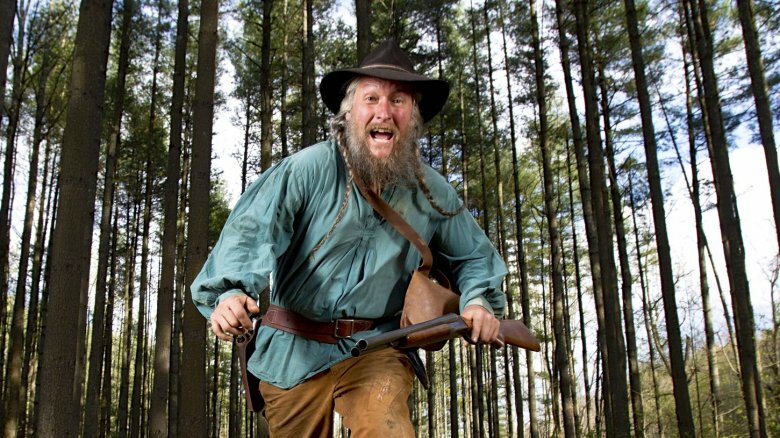 Well, the History Channel's program Mountain Men, about hard-edged survivalists eking out a living in the brutal wilderness, is just ridiculously embellished. For example, just ask one of the show's stars, Tom Oar, who joked to the Billings Gazette that the show always exaggerated his life to seem more dangerous — and less mundane — than it really was. Even the more exciting incidents, like wild animal sightings, aren't quite what they seem, such as when a wolf encounter was recreated with regular dogs. According to Alabama Entertainment, Oar's fellow Mountain Men star Eustace Conway once admitted to Eat, Pray, Love author Elizabeth Gilbert that his crazy wild man persona was mostly an act. While Conway does live out in the wilderness, by all accounts, he's not the broke, penniless fella the show makes him out to be, with writer Mechele R. Dillard pointing out that he probably makes a decent living from the expensive programs on his Turtle Island Preserve. Texans take their history seriously, and they don't like a bunch of outsiders painting them the wrong way. So back in 2015, when the History Channel aired the drama series Texas Rising, which purported to be a historical drama about the creation of the Texas Rangers, Lone Star locals stood up and took notice of the show's many historical inaccuracies. Soon afterward, the internet got flooded with so many angry Texans that even that fancy East Coast paper the Wall Street Journal commented on it. 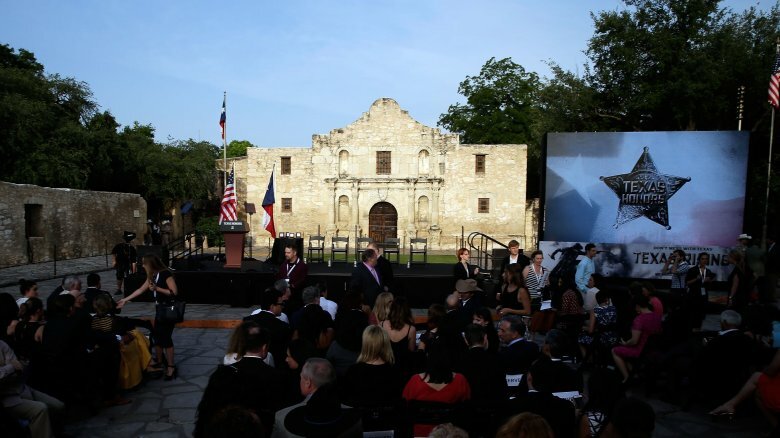 Texas Monthly ripped the series to shreds, pointing out lazily incorrect dates, inaccurate fashion trends, and the fact that the show's desert landscapes had more in common with classic Hollywood Westerns than the real Texas locations where historical events took place. Basically, the History Channel walked into a Texas bar, said all the wrong things, and got punched out by the locals. Maybe they'll be more careful next time? In 2011, Comedy Central's The Daily Show celebrated the holiday season with a section called "Tree Fighting Ceremony," where host Jon Stewart noted an amusing anecdote. 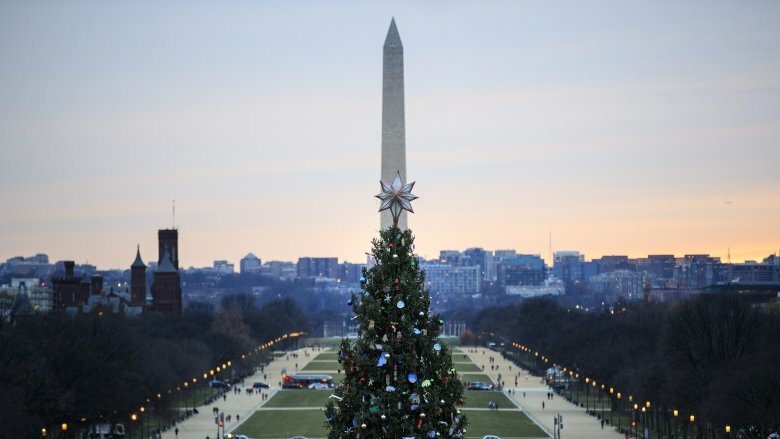 Supposedly from the years 1789 to 1856, the U.S. Congress valued Christmas Day so little that they simply used it as a regular workday, just like your local 7-Eleven. Well, fun-spoiling Politifact swooped in, studied up, and pointed out that this allegation is completely inaccurate, as both the House and Senate pretty much always took the day off. Don't blame Stewart or Comedy Central for this "pants on fire"-level error, however. The true fault lies with their source, the History Channel, which in 1997 aired a special called Christmas Unwrapped: The History of Christmas, a clip of which was aired on Stewart's program. Oops. Clearly, Stewart and The Daily Show producers thought they could trust a channel named "History." It's too bad they didn't have access to a time machine, so they could've jumped back and checked for themselves, or jumped forward and read this article. True to form, Stewart didn't hide from the criticism and responded by lampooning the History Channel for their wildly inaccurate UFO programs. 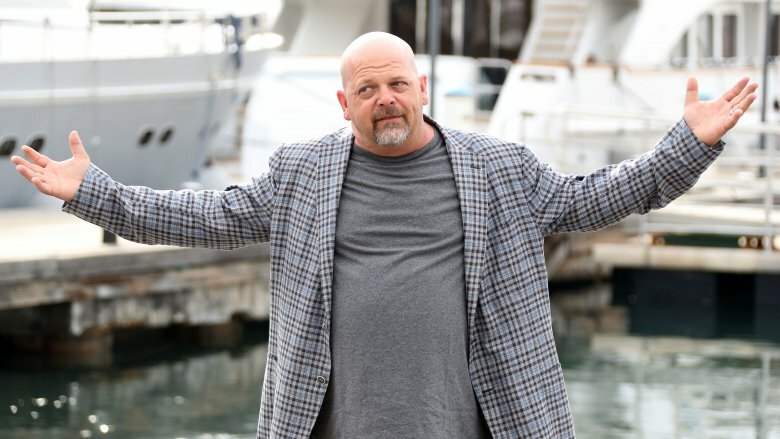 Come on, you didn't really think Pawn Stars was real, did you? Okay, maybe they call it "reality TV," and all the characters on the show also exist in real life, and it is their real pawn shop. But if you couldn't tell just from watching it and cringing every time literally anyone delivers their lines, the actual interactions are highly staged. Those seemingly spontaneous customer interactions you see on TV are arranged way beforehand: If the old dude down the corner wants to sell the shop some musket from the Revolutionary War, not only does he first sign a consent form to be filmed, but his musket is going to be vetted, poked at, and cleaned up well before the cameras roll. Even the bargaining and dialogue is lightly scripted and practiced in advance, probably to make sure neither party storms off in a huff about getting a bad deal. If you go to the Vegas shop in person, you almost definitely won't run into any of the TV stars because they never work the counters unless cameras are rolling. Apparently, if they did, people might take photos of the sellers interacting with them, violating strict privacy laws. In 2012, star Corey Harrison told Huffington Post that these days, he's far more likely to privately meet someone in an empty hallway than to bargain with them at the counter. Honestly, there are many weird things about John F. Kennedy's assassination that still don't make sense today, and the bizarre screwiness of the official explanation is enough to get even the most trusting person to question things. That said, if you're trying to uncover a conspiracy, it's important to always keep your facts straight, check your sources, and make sure not to overstep. In 2003, History aired a special titled The Guilty Men, which implicated Vice President Lyndon Johnson with having conspired to kill the president. Now, if you're going to make an accusation like that, you need some solid ground to stand on, but unfortunately and unsurprisingly, George Washington University reports that the network's source was a less-than-trustworthy convicted forger named Barr McClellan, a one-time associate of Johnson's personal attorney. McClellan's book on the subject featured passages which he himself labeled as "faction" (a catchy portmanteau of fact and fiction, before "alternative facts" was a thing). 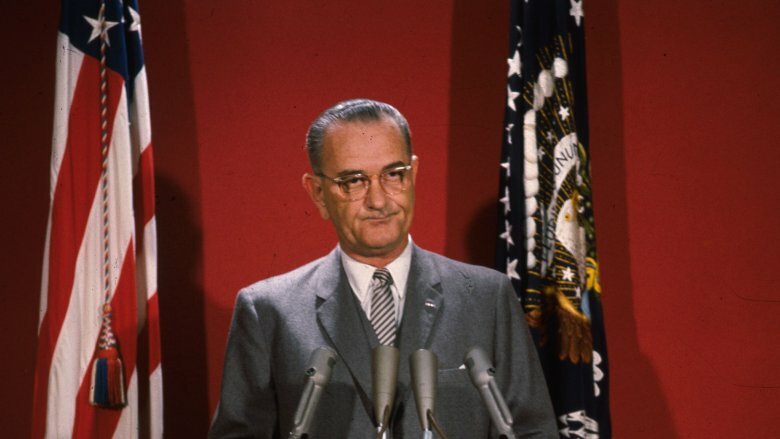 Among McClellan's more dubious claims, according to the New York Times, was the allegation that on the night before the assassination, LBJ met privately with Richard Nixon and J. Edgar Hoover at the Dallas home of oil magnate Clint Murchison to plan out JFK's murder. The problem? As the Dallas Morning News explains, LBJ wasn't in Dallas that night. Anyhow, the History Channel special got people so fired up that even former presidents Carter and Ford spoke up against it, and the network apologized for the whole thing.